Robotic spine surgery represents the highest level of precision, safety, and recovery for minimally invasive and open spine surgical options. Through the use of ultra-modern imaging technology, which creates a computerized tomography scan (CT scan), surgeons can pre-plan their patients spine to diagnose and pinpoint the health issue that needs to be addressed with increased accuracy, reduced complication rates, and limited poking, prodding and unnecessary tissue and muscle damage that generally takes place throughout the course of traditional surgery. at the Society of Minimally Invasive Spine Surgery Annual Forum 2016 examined the surgical outcomes for robotic-guided surgery and compared them with patients who underwent the procedure with freehand instrumentation. Prior to robotic spine surgery, your surgeon may use 3D planning software based on CT image of your spine to help achieve successful results. Each plan is tailored to your specific anatomy and diagnosis. This custom plan will be reviewed in a virtual 3D by your surgeon, which he has the ability to simulate the entire procedure before he enters the operating room. While in the operating room, the robotic device and the CT imaging software they use are brought into position to guide your spine surgeon through the operation according to the preoperative plan they already created. Then, miniature surgical instruments are inserted through small incisions by way of robotic arms; permitting the surgeon an unparalleled and revolutionary range of motion and precision. A high-definition, three-dimensional camera serves to guide and direct the attending physician, who navigates the surgical procedure by way of a high tech monitor and console; supplying an unparalleled and literal inside view of the patient’s back as the doctor performs every move of the surgery with the aid of their robotic counterpart. Dr. Payam Moazzaz, California’s leading robotic spine surgeon in both accuracy and number of performed robotic spine surgeries uses the Mazor X 3D planning software and robotic device for his procedures. Whatever the procedure, whether its minimally invasive spine surgery or open spine surgery, your surgeon is always in full control. 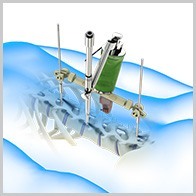 What Procedures Are Performed With Robotic Spine Surgery? Regardless of the exact nature and purpose of your robotic spine surgery, you can be assured that your procedure will involve less scarring, trauma, infection, and recovery time than more conventional surgical methods. Through his decade’s worth of experience in the orthopedic field, Dr. Payam Moazzaz has become an expert in the exciting field of robotic spine surgery. If all noninvasive, nonsurgical modes of treatment prove ineffective, he will guide the patient through this gentle and effective procedure; ultimately setting them back on the all-important path toward health and mobility. Contact New Era Spine today to arrange a consultation on the subject of robotic spine surgery. Dr. Payam Moazzaz is a spine surgeon that applies a decade’s worth of accumulated experience as an orthopedic physician and surgeon to the diagnosis and treatment of a vast variety of complex spine disorders.